MURRAY HILL, N.J., May 9, 2013 ---�Glowpoint, Inc. (NYSE MKT: GLOW), a leading global provider of�cloud and managed video services, today reported its financial results for the first quarter ended March�31, 2013. Adjusted EBITDA (as defined and reconciled to GAAP below) for the first quarter of 2013 was $837,000, an increase�of 17% over the same period last year.� The Company generated cash from operations of $264,000 for the first quarter of 2013. "We achieved quarterly revenue growth year-over-year through the acquisition of Affinity and are pleased to report positive Adjusted EBITDA and�cash flow�from operations for the first quarter," stated�David Clark,�CFO of Glowpoint. "With respect to our�balance sheet,�we ended the quarter with positive�working capital�and $2.2 million of cash." "Since becoming Glowpoint's CEO in January, we have been conducting a strategic market analysis and internal review, with the aim of identifying business improvements that would directly address the evolving video market," said Peter Holst, CEO and President of Glowpoint. "As a result of these efforts, a company transition is now underway that will continue through 2013." "Several key initiatives are in place. First, we are continuing to develop a diversified sales model that mixes OEMs with emerging partners, enterprises, and non-traditional end user customers.� Second, we are also working with partners in the existing channel to increase the availability of our services worldwide. Third, based on the changing needs of medium to large enterprises, we are continuing to enhance our products to better address buyer requirements. Our customers are asking for solutions that include core video infrastructure (on premise or in the cloud) and video devices, the ability to extend video reach beyond the enterprise, and business-focused support services to ensure a quality video experience." Added Holst, "Our objective is to increase sales traction with�medium to large enterprises, with revenue increasingly derived from a healthy mix of traditional OEM, enterprise, and channel accounts.� We also believe that the size of our addressable market will increase and our sales cycles will decrease as a result of our strategy." Revenue for cloud and managed video services ("Managed Services Combined" as reported), which accounted for 60% of total revenue, was $5.1 million for the first quarter of 2013, an increase of 56% compared to $3.3 million for the same period last year.� This increase in revenue was attributable to the Affinity acquisition. Network services revenue for the first quarter of 2013 was $3.07 million, relatively unchanged from $3.14 million for the same period last year.� Professional and other services revenue was $300,000 for the first quarter of 2013, relatively unchanged from $309,000 for the same period last year. Glowpoint will host a conference call at 4:30 p.m. EDT today to discuss the financial results for the first quarter of 2013, along with updates on the business. To view the webcast, please visit:https://glowpoint.webcasts.com. To participate in the teleconference, callers may dial the toll free number +1 877-407-1869 (U.S. callers only) or +1 201-689-8044 (from outside the U.S.) For those unable to view or participate in the live call, a recording of the call will be archived for viewing two hours following the call at�www.glowpoint.com/investor-relations. Glowpoint, Inc. (NYSE MKT:�GLOW) provides�cloud and managed video services�that make video meetings simple, reliable, and the standard for bringing people together for business meetings. Through our OpenVideo� cloud, we make video meetings the replacement for in person and audio conferencing with our suite of cloud and managed services that permit any device to connect across any network, simply and reliably. 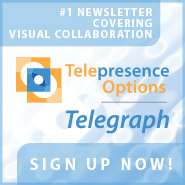 Glowpoint supports hundreds of clients located in 68 countries and is the trusted partner for leading unified communications providers, telepresence manufacturers, global carriers and A/V integration firms. In addition, Glowpoint offers access to thousands of public videoconferencing facilities to extend businesses reach and provide the ability to meet face to face across the globe without boundaries. To learn more please visitwww.glowpoint.com. Adjusted EBITDA is defined as net income (loss) before depreciation, amortization,�interest expense,�interest income,�taxes, stock-based compensation, asset impairment charges, acquisition costs and severance. Adjusted EBITDA is not intended to replace operating income, net income, cash flow or other measures of financial performance reported in accordance with generally accepted�accounting principles.�Rather, Adjusted EBITDA is an important measure used by management to assess the operating performance of the company. Adjusted EBITDA as defined here may not be comparable to similarly titled measures reported by other companies due to differences in accounting policies. Additionally, Adjusted EBITDA as defined here does not have the same meaning as EBITDA as defined in our�Securities and Exchange Commission�filings prior to this date. A reconciliation of Adjusted EBITDA to net income (loss) is shown below. The information in this release may contain statements that are or may be deemed to be forward-looking statements and involve factors, risks, and uncertainties that may cause actual results in future periods to differ materially from such statements. 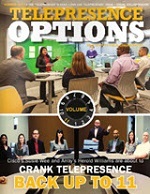 These factors, risks, and uncertainties include market acceptance and availability of new video communications services; the non-exclusive and terminable-at-will nature of sales agreements; rapid technological change affecting demand for our services; competition from other video communication service providers; and the availability of sufficient financial resources to enable us to expand our operations, as well as other risks detailed from time to time in our filings with the�Securities and Exchange Commission.�We make no representation or warranty that the information contained herein is complete and accurate; we have no duty to correct or update any information. Adjusted EBITDA (as defined and reconciled to GAAP below) for the first quarter of 2013 was \$837,000, an increase�of 17% over the same period last year.� The Company generated cash from operations of \$264,000 for the first quarter of 2013. \"We achieved quarterly revenue growth year-over-year through the acquisition of Affinity and are pleased to report positive Adjusted EBITDA and�cash flow�from operations for the first quarter,\" stated�David Clark,�CFO of Glowpoint. \"With respect to our�balance sheet,�we ended the quarter with positive�working capital�and \$2.2 million of cash.\"
\"Since becoming Glowpoint's CEO in January, we have been conducting a strategic market analysis and internal review, with the aim of identifying business improvements that would directly address the evolving video market,\" said Peter Holst, CEO and President of Glowpoint. \"As a result of these efforts, a company transition is now underway that will continue through 2013.\"
\"Several key initiatives are in place. First, we are continuing to develop a diversified sales model that mixes OEMs with emerging partners, enterprises, and non-traditional end user customers.� Second, we are also working with partners in the existing channel to increase the availability of our services worldwide. Third, based on the changing needs of medium to large enterprises, we are continuing to enhance our products to better address buyer requirements. Our customers are asking for solutions that include core video infrastructure (on premise or in the cloud) and video devices, the ability to extend video reach beyond the enterprise, and business-focused support services to ensure a quality video experience.\"
Added Holst, \"Our objective is to increase sales traction with�medium to large enterprises, with revenue increasingly derived from a healthy mix of traditional OEM, enterprise, and channel accounts.� We also believe that the size of our addressable market will increase and our sales cycles will decrease as a result of our strategy.\"
Revenue for cloud and managed video services (\"Managed Services Combined\" as reported), which accounted for 60% of total revenue, was \$5.1 million for the first quarter of 2013, an increase of 56% compared to \$3.3 million for the same period last year.� This increase in revenue was attributable to the Affinity acquisition. Network services revenue for the first quarter of 2013 was \$3.07 million, relatively unchanged from \$3.14 million for the same period last year.� Professional and other services revenue was \$300,000 for the first quarter of 2013, relatively unchanged from \$309,000 for the same period last year.